1. Fully customised interior design and execution. 2. 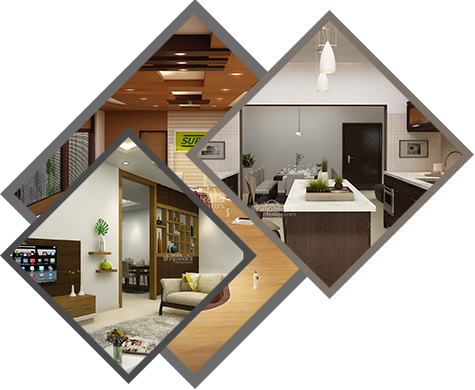 Prepares interior layout & rough estimate as per your floor plan. 3. Readymade packages in both premier and economic scale. 4. 3D-perspective plan before beginning the carving works. 5. We only uses super quality and branded materials. 6. 20+ corporate customers in commercial and 300+ households in residential. 7. Multi level guaranteed quality inspection in all project phases. 8. 1 year free service for all works from the project delivery. 9. 3 Branches of operation for more efficient local service. 10. 25+ years of work experience, since founded in 1990. Over 25 years we have been instrumental in the changing trends of interior design works at all the parts of kerala. We are using only good quality and branded materials, with professional and expert manpower, reasonable pricing and meet your all needs to make a house a home. Works are executed at your site, so you can inspect the quality of raw materials and workmanship. Our well experienced supervisors will inspect the quality of each and every materials and workmanship of labours in each process stage. Our kitchen cabinets are 100% water resistant and fire retardant. We provide a PVC covering on the back side of each interior fit outs & PVC skirting to protect the object from wet weather conditions.